At one time, Miley Cyrus had gorgeous, long, brown hair which was versatile in s..
At one time, Miley Cyrus had gorgeous, long, brown hair which was versatile in styling options. In this photo, Miley wore a messy, curly chignon which would be perfect for prom. Any woman should be able to create this hairstyle at home. Curl ends of hair using a small or medium-barreled curling iron. Then style hair in a loose bun at the nape of the neck and secure with either bobby pins or clear elastic bands depending on the length and weight of hair. Allow some face-framing layers to hang loose to soften the look. A short, punk coif with both sides buzzed such as Miley Cyrus’ is quite a burden..
A short, punk coif with both sides buzzed such as Miley Cyrus’ is quite a burden to grow out. In-between hair can be a pain. That was all before she debut her new coif! The longer top allowed her to cover the used-to-be shaved part of her hairstyle and make it appear like a short bob. Above-the-brow choppy bangs opens up her lovely eyes even more and adds a youthful touch to her face. What do you think? Yay or nay? Miley Cyrus took the 2013 American Music Awards like a wrecking ball with her u..
Miley Cyrus took the 2013 American Music Awards like a wrecking ball with her uber cool undercut and white Versace suit. We like ’em both…..a lot! Her short coif is demurely styled this time (zero horns). To get a rockin’ lift on top, apply mousse before blow drying hair. From the front, roll the brush back towards the crown while lifting from the roots. Scrunch the top a little once done. Miley Cyrus’s long, brown hair is styled in a classic side braid. The top layer o..
Miley Cyrus’s long, brown hair is styled in a classic side braid. The top layer of hair is left loose and hangs in waves around the face. Miley Cyrus’s straight blonde hair is cut in a modern undercut hairstyle. It’s sha..
Miley Cyrus’s straight blonde hair is cut in a modern undercut hairstyle. It’s shaved on the sides and longer on top in this fierce, edgy look. Oh, Miley! Miley, Miley, Miley! The “We Can’t Stop” singer arrived at the 2013..
Oh, Miley! Miley, Miley, Miley! The “We Can’t Stop” singer arrived at the 2013 VMA’s with full intent to show that she is a full-blown sultry woman starting with two mini buns (resembling devil horns) as hairstyle. Want it? Apply mousse on damp hair before creating two sections. Twist each section and secure with a pin. Holy rockstar chic! Miley Cyrus refers to this look as “the haircut that changed m..
Holy rockstar chic! Miley Cyrus refers to this look as “the haircut that changed my life”. Why it works? The cut suits her heart-shaped face and she has the right kind of attitude for it. And, oh, she’s young. 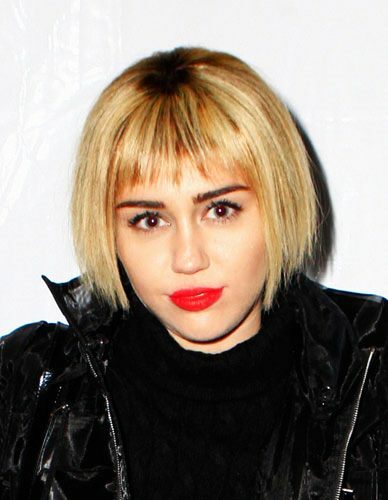 Miley Cyrus’s blonde curly hair is cut in a bob haircut just above the shoulders. This cut works well with naturally curly or permed hair. To style, apply volumizer to roots of hair and mousse to the entire length of hair. Scrunch and dry with a diffuser hairdryer.